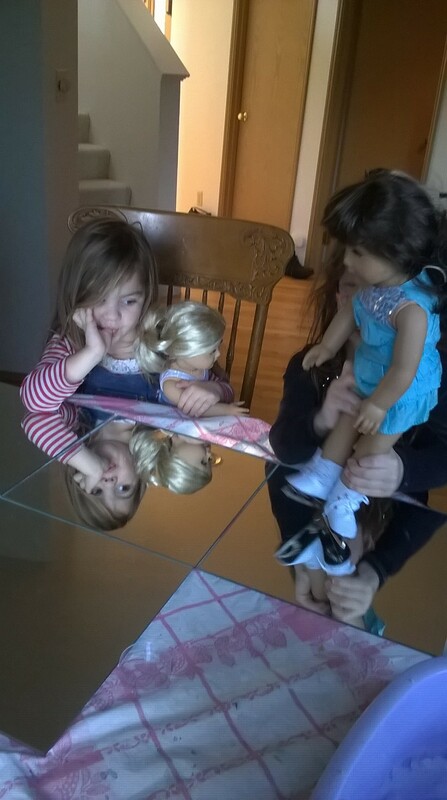 The girls often enjoy mirror play, I’ve tried a number of different types. I love this big one but it is very fragile and difficult to store. 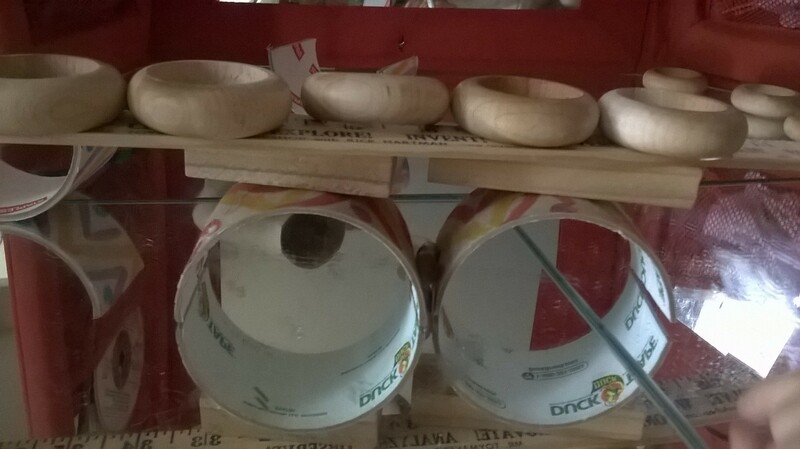 For small projects, I have an oval mirror in a tray but it isn’t big enough for more than 2 children to play with. Unframed circular mirrors work well, but I’m yet to find a suitable one. We also use Ikea mirror tiles, these are portable and I can change the arrangement to suit the project but the pointed edges bother me. Suddenly it came to me – “why not stick the mirror tiles onto a table?” I sent out a plea for a table to my Buy Nothing group. I didn’t expect to find one that was the perfect size but within 30 minutes I had been offered a table that would fit the tiles perfectly. The mirror tiles come with sticky pads for mounting to a wall. 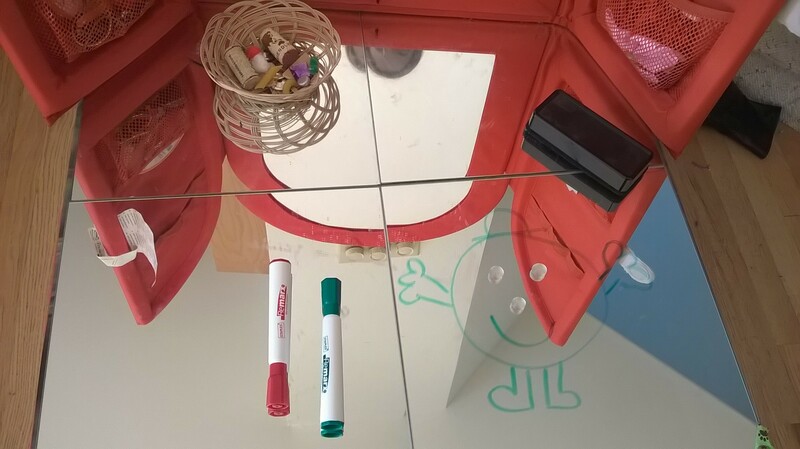 These were perfect for attaching the mirrors to the table. I taped the sharp corners with duct tape and a vanity mirror was placed against the wall. In a preschool setting I would mount more tiles to the wall and put the table in front to allow for seamless reflections. The border around our mirror makes it difficult for small items to be reflected in the upright mirror. 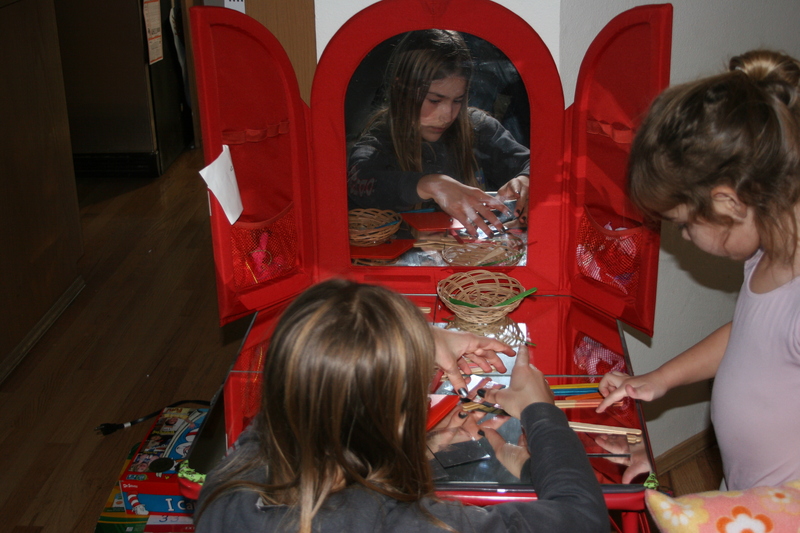 A couple of small card mirrors and a few loose parts led to fun explorations. 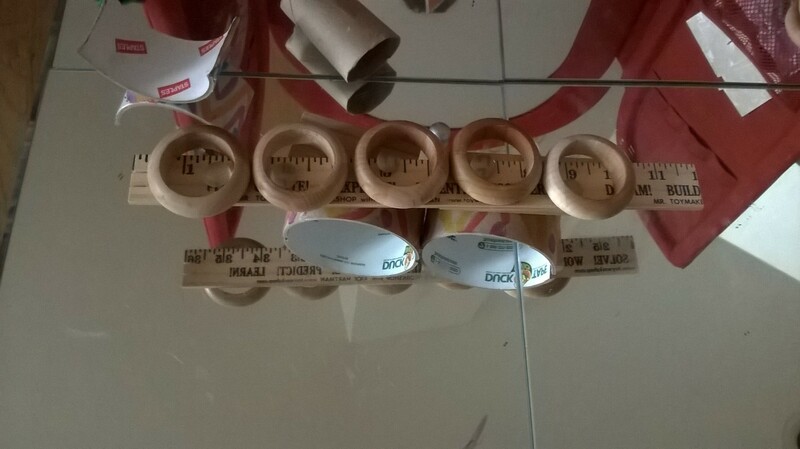 I cut the insides of a roll of tape in half and placed them on the table with a few wooden rings. To keep the interest going, I changed the materials regularly. The loose parts, building bricks and mirrors maintained interest for only a short time. 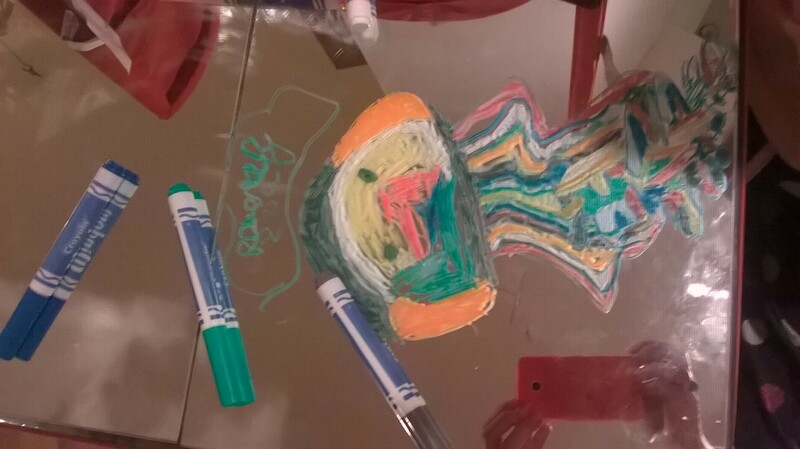 Knowing that my children love to draw and write, I decided to leave white board markers and a rubber on the table to see if this would engage them. This arrangement was perfect and by far the most popular so far. 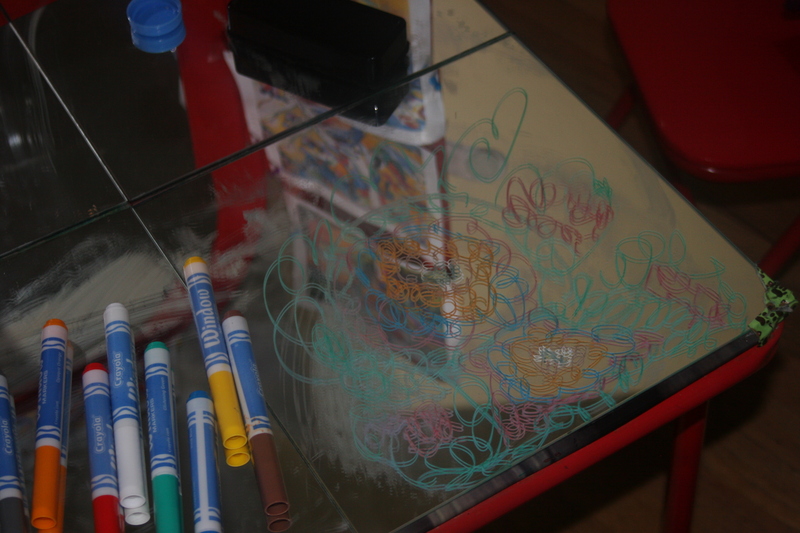 To add variety, I purchased a pack of glass markers. This was a very different experience. 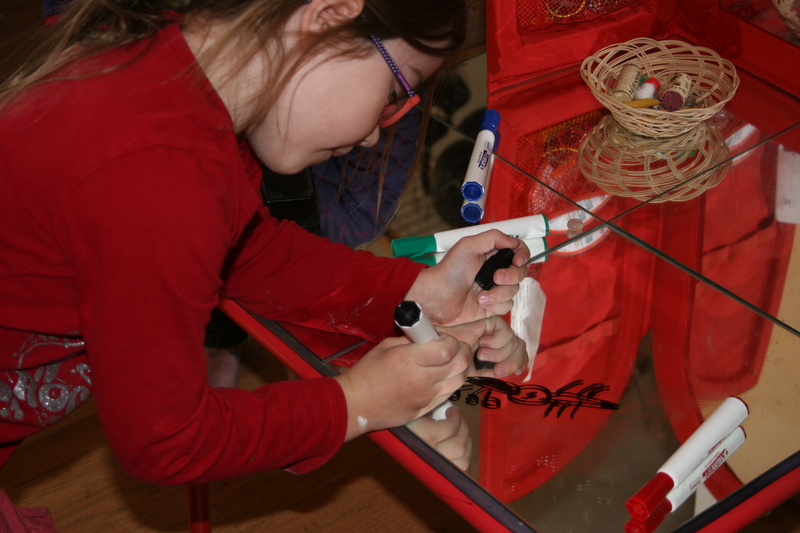 The girls discovered that the pens were difficult to erase. They liked that they no longer needed to avoid erasing part of the picture with their sleeve. 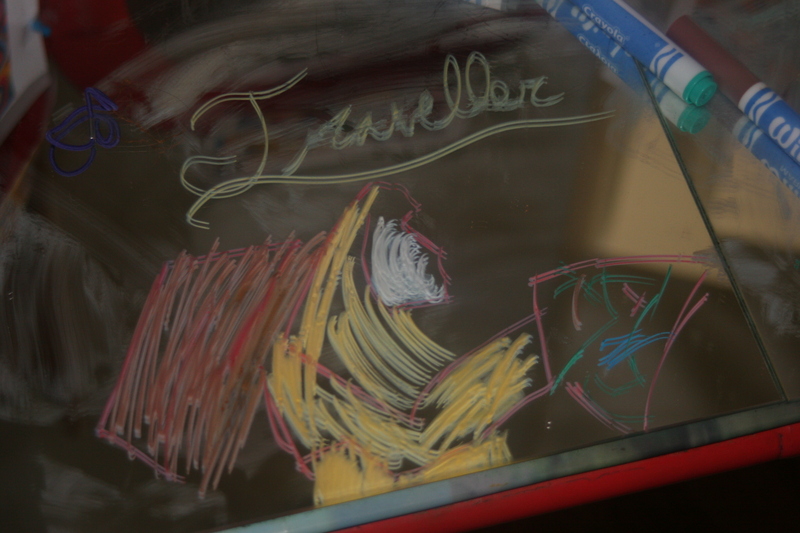 It took more effort to erase and the girls experimented with the best ways to do this. Since they love to use cleaning sprays, I showed them how to use a small amount of glass cleaner to remove the pens quickly. I noticed that the style of drawing changed when I introduced these pens. 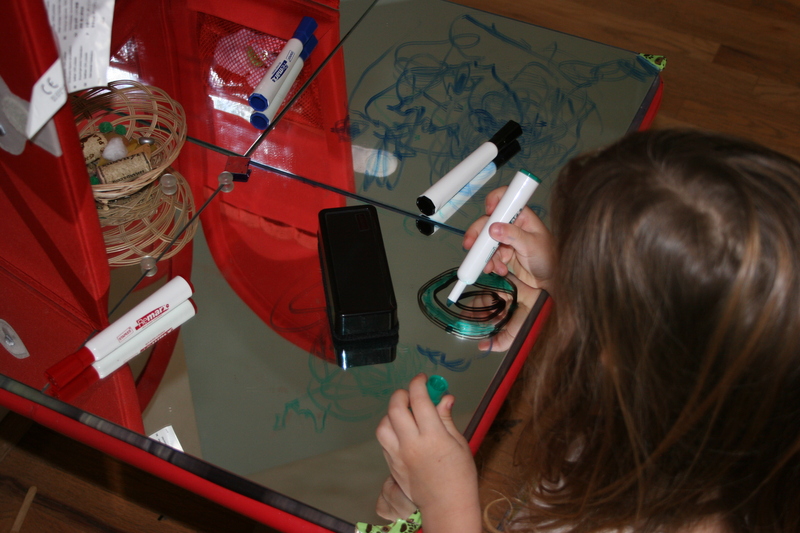 The girls drew intricate patterns using the colours and adapting their movements to light touch of the pens. This one reminded me of Kandisky ( and a pattern in one of the earlier photographs is reminiscent of concentric circles). “I like drawing random things that come into my head. Then they don’t have to be anything” said my 6-year-old. I explained that this is called abstract art. I have an artist friend and we all visited her exhibition recently. I told them that this was the kind of art that she makes. 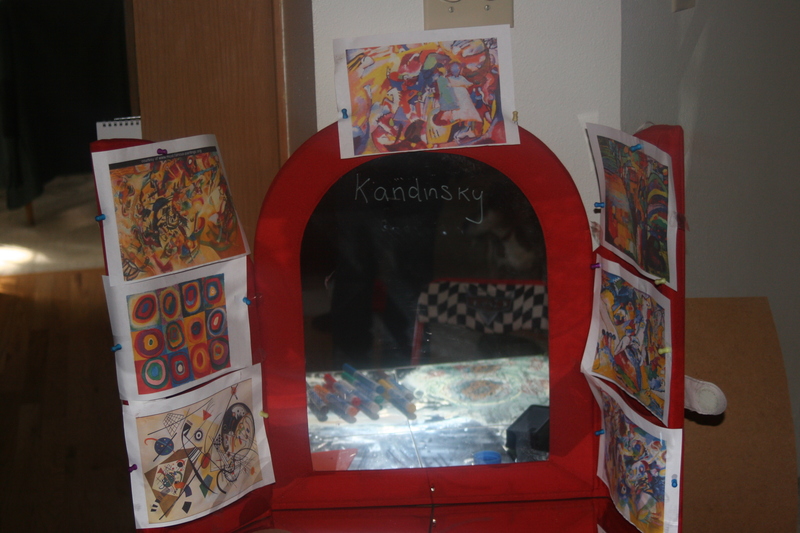 Later, I printed some Kandinsky paintings, placing them around the edge of the vanity mirror. “Why did you name this one the traveller?” I asked. 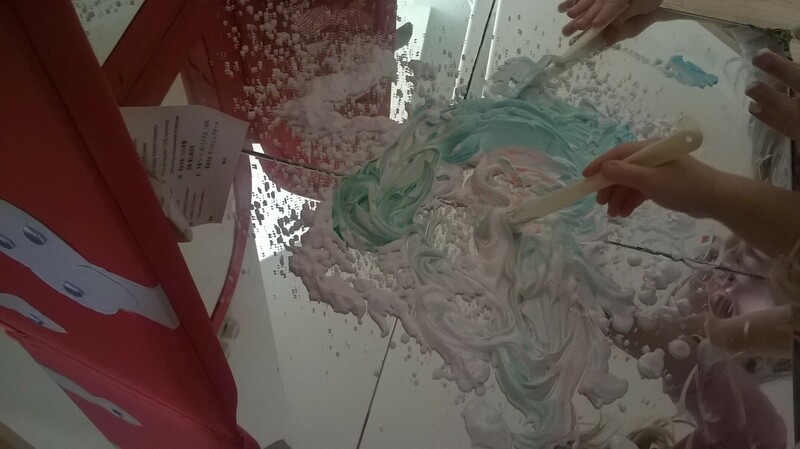 The mirror table is also the perfect surface for shaving foam. 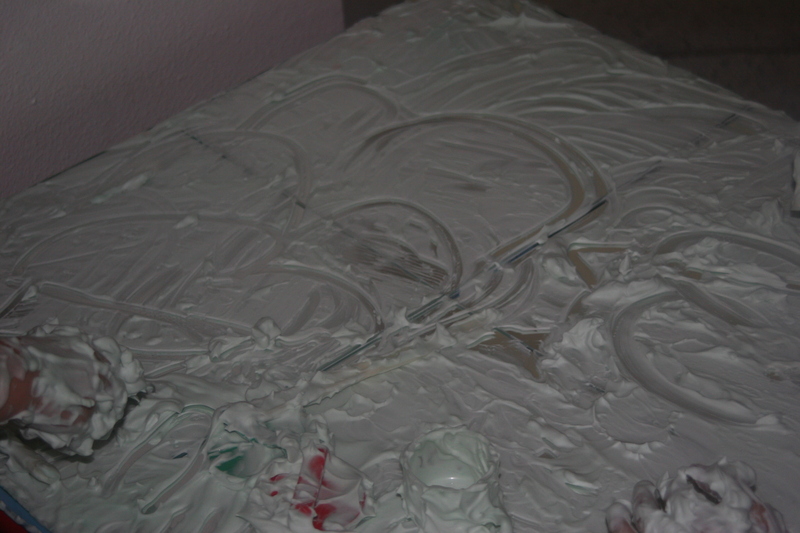 On a flat, even surface their natural instinct was to cover all the space, smoothing it over like icing a cake. They began to create a story. How about we’re the servants and it is the queen’s birthday and she wants us to decorate everything? Now we need it all smooth again. We are the servants. Wait, she said decorate everything. How about our hands? Oh no there are some gaps. Maybe the queen will be mad. Come on we’ve got to make it smooth. I don’t think she’ll be mad. She is the nicest queen. Everyday for pudding she gives us cupcakes. It’s all textury, move your hands around like this. Or I could do an M – like this. The scenario soon changed to one where they were at school. There is lots and lots of art but you don’t like doing it, do you? No, but remember we’re playing a game where you don’t like being creative . You just like playing video games and stuff. Do you know what I’m going to do next? Neither do I but it will be something creative. How about you make a snowball? 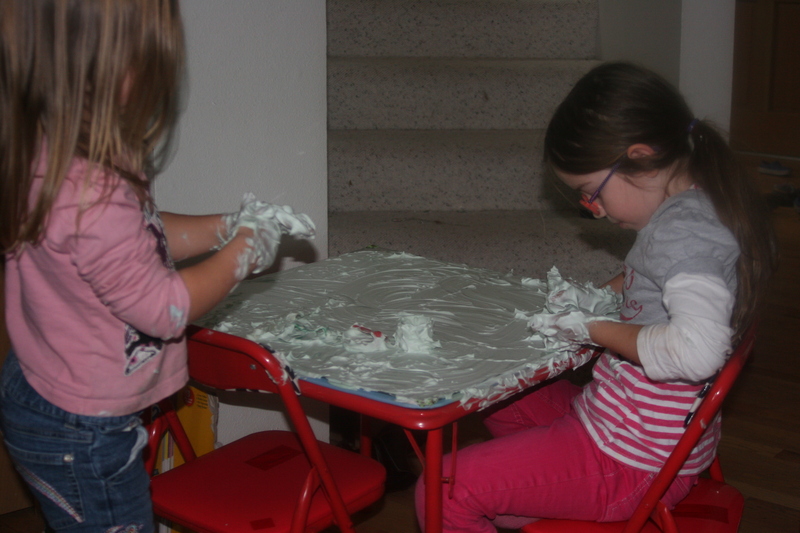 The girls abandoned a game of Minecraft when I put the foam out. It is interesting that they were exploring ideas about creativity in their play. 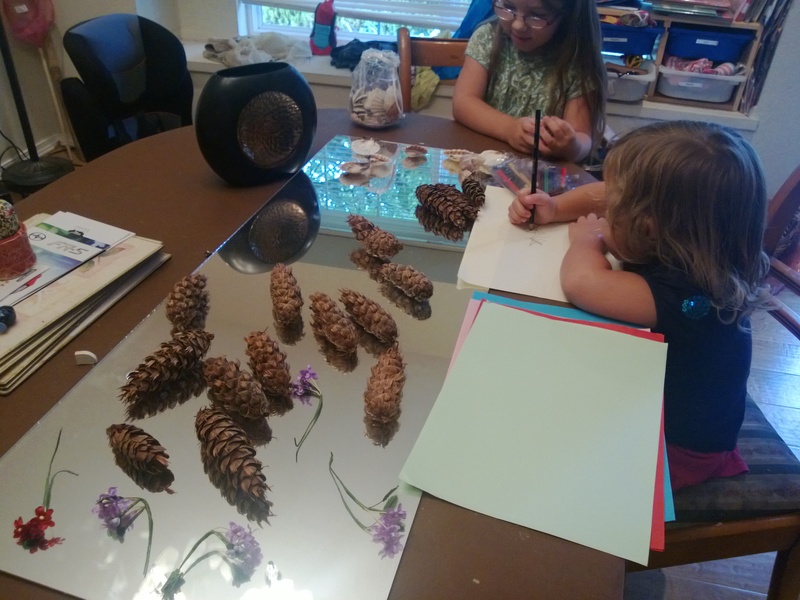 Additional mirror table activities can be found on my mirror table Pinterest board.